Language (App & cloud) : Arabic, Chinese Simplified, Chinese Traditional, English, Hindi, Indonesian, Malay, Nepali, Spanish, Thai, Turkish, Vietnamese. Other languages are available upon request. • Suitable to install during deployment of lift car and construction work. • The card reader panel must be installed on top of the lift car, and all data cables have to follow the lift car travelling cables as protection. • The data cables shall be extended to reach the computer at the guardhouse or at the reception area, where the software is installed. • Due to the complexity of cabling and renovation works, this system needs to be established along with the building construction. • The installation can be carried out before/after the building project is completed because the TimeTec BLE-16 is an electronic panel to be installed with the lift card button panel. The wiring involved is only between the BLE-16 and the lift car button panel, available inside the lift car. 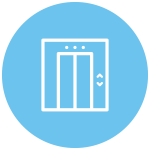 • The lift card reader panel is designed based on the floor quantities for each lift system and the customisation must fit into each building. • By default the TimeTec BLE-16 supports 16-floors access, and it supports a stack-up design. For building with more than 16 floors, stack the BLE-16 panels to support more floors. • Only the system provider can override the system as the card reader is integrated into the lift car electronic system. • The TimeTec BLE-16 is installed on top of the default lift car button panel, it does not affect the default button functions. Hence, in case of emergency or failure, a system admin can override the system using a switch to use the lift car default button system. • The lift card access system requires you to deal with a lift car manufacturer because the system is integrated with a lift car system. The cabling of card reader is passing through the lift car travelling cables that are installed on top of the lift car thus it requires a professional technical person to perform the job. The cabling to guard house or reception is concealed, making it a big challenge for maintenance work. • The installation of TimeTec BLE-16 is done in the lift car, therefore the maintenance work only takes place inside the lift car. The BLE-16 only connects to the button panel that requires minimum maintenance. • It requires a special software developed by the card reader manufacturer and usually it can be accessed by the system admin only. • All residents' data and accessible floors are managed by the system admin only. The residents can only receive individual card to scan at the card reader inside the lift car. • No software installation is required because TimeTec BLE-16 is a cloud-based software available on any Internet browser. • With BLE-16, the system admin manages the residents’ data and accessible floors but the resident scan download and install a mobile application available on both iOS and Android smartphones to review their personal data and accessible floors. • Requires a PC-based software to be installed into a computer for management and handling of the system. The management software is usually developed by 3rd party vendor that requires an annual maintenance payment contract for software updates. • The software versioning depends heavily on lift car version and manufacturer. • Requires system admin to attend a full training to learn about the system. • SaaS or cloud-based software operates on a subscription basis and system updates are available from time to time all year long for as long as the subscription is active. • All functions offered are compatible with the TimeTec BLE-16, and they have nothing to do with the lift car version, or its manufacturer. • The cloud-based system is user-friendly and the system admin can install the mobile application into both iOS and Android devices for system admin to operate the system seamlessly at anytime. • Very minimum security is offered because everything is stored inside a computer. Any physical damage to the hardware can cause the system to corrupt, users’ data breach and etc. 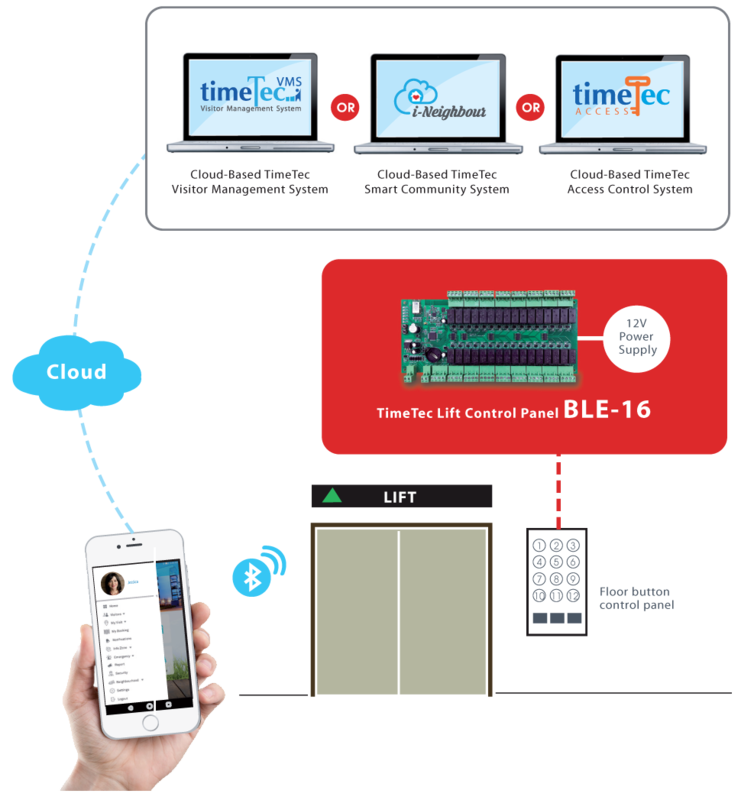 • TimeTec BLE-16 presents high security because the database is stored on the cloud server. Only the system admin can access to the database and audit trails of activities are available if anything unfortunate happened to the system. • The cloud-based system supports multi-level access to restrict access levels of every user to prevent any misuse. • The cloud-based system supports multi-tenant design to protect data privacy of each customer. • All configuration and controls are carried out by the system admin and the normal users are not allowed to access at all. • The system admin can access to manage the system anytime from anywhere and there is no restriction on the operating software to access the system because it is a cloud-based solution. Users can access to manage their details as well. • The card reader installed can only support cards issued by the system provider. • BYOD (bring your own devide) concept. Users can install and login to mobile application on both iOS and Android smartphones that support Bluetooth connectivity to work as access credentials to BLE-16.